Both pictures are looking up the trunks of Birch Trees, Betula papyrifera. Pictured on the left are Birch Polypores, Piptoporus betulinus, on the right are Tinder Conks, Fomes fomentarius. Along the North Shore of Lake Superior these conks seem to be everywhere there are Birch Trees. Both mushrooms have had quite a few uses through out history. Possibly most famously, both were carried by Otzi the Iceman, the neolithic man found preserved, clothing and possessions included, in the Otzal Alps in Italy. It is speculated that the Birch Polypore was used medicinally, while the Tinder Conk was used to keep an ember smoldering. (Reading about all the equipment he carried in the link above is fascinating. 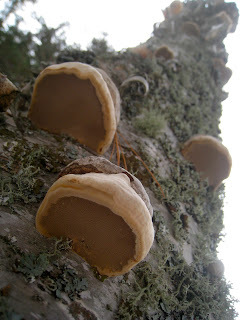 The Birch Polypore can be used as a strop for sharpening razors. 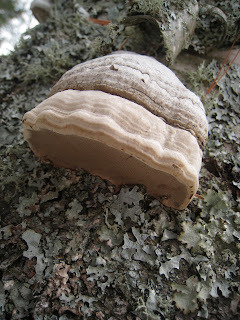 Both can be used to control bleeding (I suppose this falls into the medical category already mentioned); I saw a picture of someone who had used a fresh slice of Birch Polypore as a self adhering bandage. The Tinder Conk can be made into a felt-like fabric, after being soaked in water and pounded. The fabric is called Amadou. One of its uses is for drying fly fishing lures. 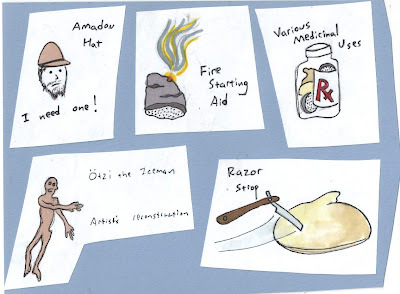 Even cooler, Amadou has traditionally been fashioned into hats in parts of eastern Europe. You can't imagine how badly I want one! Birch Polypores are annuals (they refruit each year), but last for awhile on the sides of Birches before decaying and/or falling off. 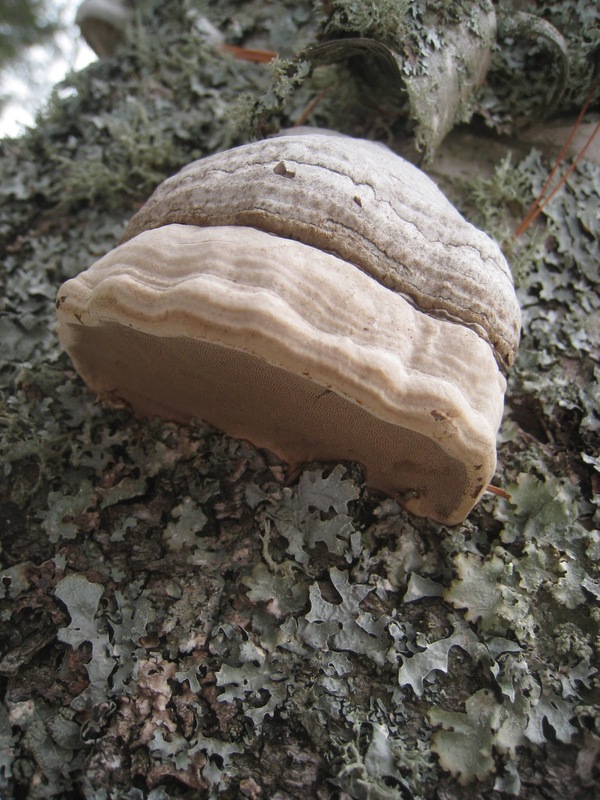 The Tinder Conk is a perennial fruiting body and adds a new layer of pores each year. While researching information for these two mushrooms I came across a few new (to me) mushroom websites that look interesting and very informative. They are summarized below, at the end of the post. I also rediscovered "Mycelium Running - How Mushrooms Can Help Save the World" by Paul Stamets. It's full of information beyond the normal how to identify and can I eat it sort (which don't get me wrong, is also really interesting). 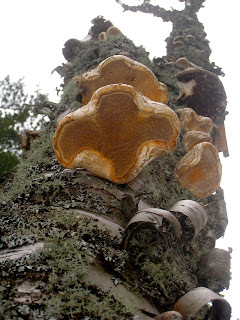 Detailed information about the medicinal properties of the Birch Polypore. Not new to me, but an excellent source of information.